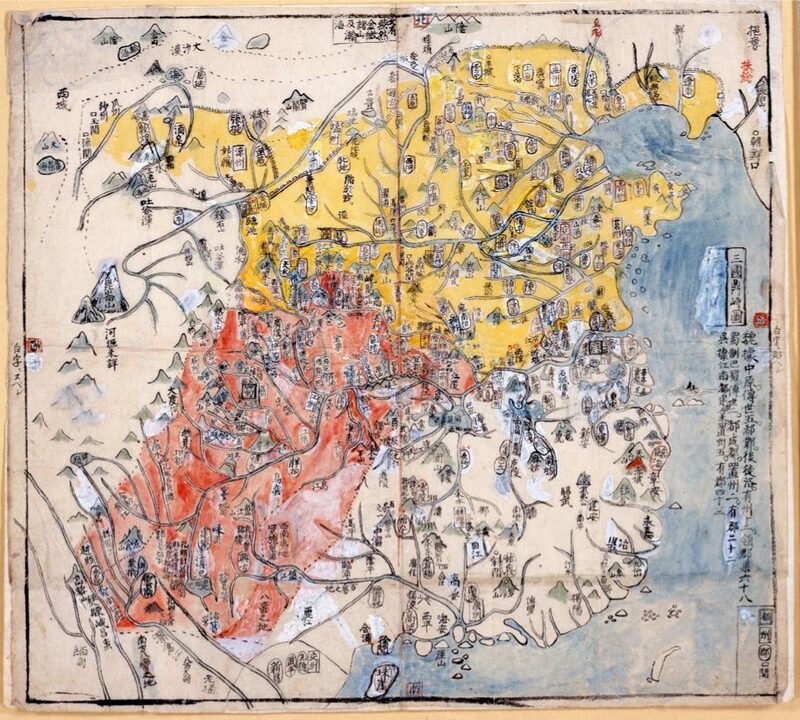 The famous Tadataka Inô (1745 – 1818) once mentioned “I know how hard it is to create a map of the whole country, for I walked it and tried to measure it.” Further it is said that he told people “It really is astonishing that Sekisui from Mito was able to create such a good map while only sitting” (quoted from “Fûken Komiyama: kaihô nissatsu” in “Inô Tadataka Research” by Sachiko Maeda). Of course, when it comes to accuracy, the map can’t be compared to that of Inô. But when one looks at the practical application there is a difference as stark as day and night. 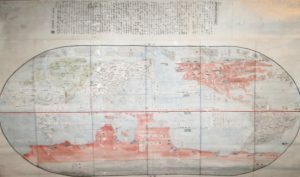 For reasons of national defense Inô’s map was forbidden from being published while the map made by Sekisui was widely used until the Meiji period serving well as a road map. “Science should be of use for all and everyone. As a hobby I decided to make maps. I also liked traveling. There was a fellow student named Heizô Shibata, and I could take a look at kuniezu [maps ordered by the Tokugawa bakufu] and ryûsenzu [maps created during the early Edo period] of all the domains. I used the latitudes measured by Harumi Shibukawa (1639 – 1715)” (Kômyô NAGAKUBO: chizushi tsûron). In the preface of “Kaisei nihon yochi rotei zenzu” Ritsuzan Shibano writes: “At first he would put a map of Japan on the sliding door and then he invited travelers into his home to gather information for more than 20 years.” The original map is in possession of his descendent Hajime NAGAKUBO. 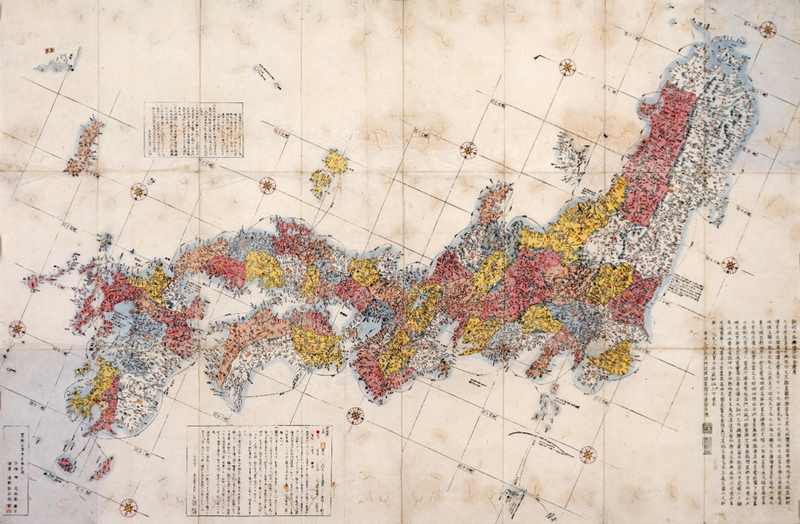 The revised map was then revised once more and finally published in Oosaka in 1780. Even while the bakufu was keeping an eye out, he couldn’t suppress his curiosity and urge for knowledge. Not only that, he wanted to share the shape of the world with his fellow Samurai. So he went ahead and got himself embroiled in a strictly confidential affair. Therefore it must have been a great relief that the map of China, the “daishinkôyozu” was made by the order of the domain’s feudal lord. As he finished that map at the age of 67 it was once more desired of him to create a historical map, which led to the creation of the aforementioned “Tôdo rekidai shûgun enkaku zu”. This handy map consists of 13 foldable pages giving an overlook over the various provinces of China divided and sorted by different generations. The map lists not only the distance between cities in China but also the eight different seaways from Japan to China and their distances. It also has an overview of the Seven Warring States and a road map of China during the Tang dynasty. The place to which the homesick Abeno Nakamaro refers to in his famous waka “If one looks at the vast skies…” is Meishû (today’s Ningbo in China). But as Professor Emeritus of Yamagata University, Toshio Gotô, points out, Meishû was only mentioned in Sekisui’s road map of Tang China. As the world calmed down, the new Meiji government started to pick up people who despite their successes during the Edo period never got to fame and awarded them with posthumous honors. From the former Mito domain, Sekisui was deemed applicable for such an honor and was awarded the rank of “jûshii”. The reason for this lay in his service to Japan in compiling the geographic portion of the dainihonshi (Great History of Japan), a project started by Mitsukuni Tokugawa. This was in the year 34 of Meiji 1st of June. It is said that fireworks were lit at Sekisui’s grave to celebrate the occasion. Usually one would expect that after retirement at the age of 70 one would be allowed to lay down one’s work as a scholar and retire. Not so Sekisui though. To cover his expenses at old age he received seven fuchi from his lord and three fuchi from the lord of the Shishido domain and was ordered to compile the geographic portion of the dainihonshi. Sekisui’s lord was entrusted with 10 years of work and wouldn’t let him go. To a letter in which Sekisui asked for his sons return to home, the lord responded: “We will fulfill the direct order of our lord to compile the geographic portion even at the cost of our lives. Know that until death you will take up the brush and think of nothing else” (Henun NAGAKUBO (ed. ): chiseigakusha nagakubo sekisui den). So he studied an enormous amount of material, analyzing and selecting it with the greatest care and kept on writing.